SAINT LEON SUR VEZERE: The charming village of Saint-Léon is nestled in a bend of the Vézère half way between Montignac and Les Eyzies. 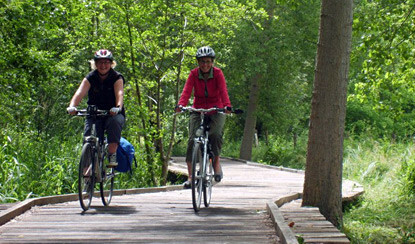 Dominated by the Côte de Jor, it is situated in picturesque countryside typical of the Périgord Noir. The roman church (XIIth century), jewel of Saint-Léon is also important place for the famous Music Festival of the Perigord Noir. The chapel espiatory reveals its legend at the entrance of the old cemetary. 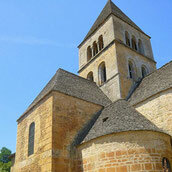 Towns: In the middle of the « black Perigord » Sarlat, the medieval city, proposes you a fabulous architectural heritage. 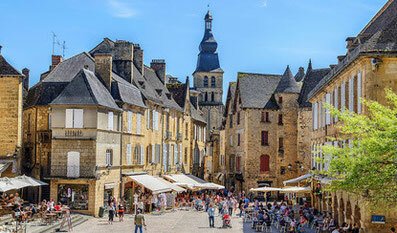 Each Saturday you can walk along its market in front of the Town Hall and find all the typical products of the country all around the old city.Concerning its heritage, the numerous classified buildings, houses make Sarlat the first European city. Sarlat is classified city of Art and history, was and is the scenery of numerous films. It is the perfect city to have a romantic ballade. Périgueux located on the Ways of St Jacques de Compostelle and his museum gallo-romain. The Truffle: fresh in winter with an incomparable savour. Boletus: generally at the end of the summer or with the autumn. The savour of fresh boletus is single and is typical kitchen périgourdine. 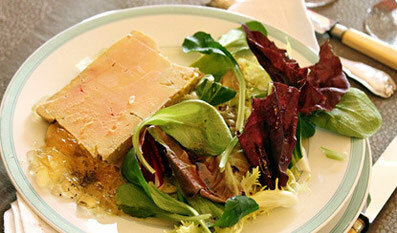 Nuts of Périgord: been used either in salads or desserts. You will be able to find all these products on the stalls of the local markets as in the good restaurants of where you will appreciate all savours of the area. Gardens: Jardins de Marqueyssac, Jardins d'Eyrignac, Jardins de l'Imaginaire in Terrasson, Jardins de Cadiot in Carlux. Festival of the International Folklore in Montignac with dancers and musics from the whole world. 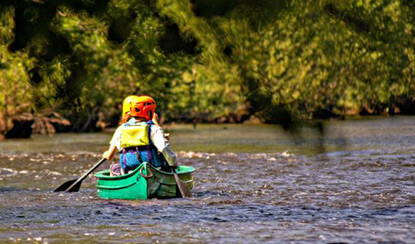 The canoe : to discover the area on the Vézère or the Dordogne. 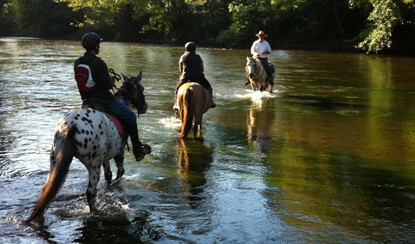 Horse riding: in Saint Léon sur Vézère, Rouffignac or Tamniès. Along the river Dordogne, the castles of Montfort, Beynac, Castelnaud will continue your historical circuit. From the birth of humanity through the antiquity, the Christian era the Perigord offers you a complete picture of the architectural evolution. 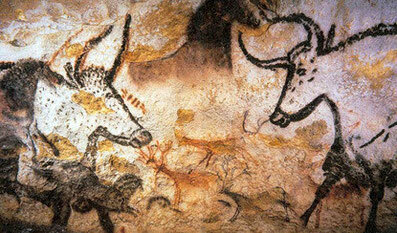 Nearby Amenities: Lascaux II caves in Montignac 10 kms, Sarlat 20 kms, Perigueux 45 kms, Les Eyzies 12 kms - Airports - Bordeaux 153 kms, Toulouse 216 kms, Bergerac 65 kms - Swimming lakes - Tamnies 15 kms - Canoeing 5 kms, Horse riding 2 kms at St Léon - Golf course at Périgueux. 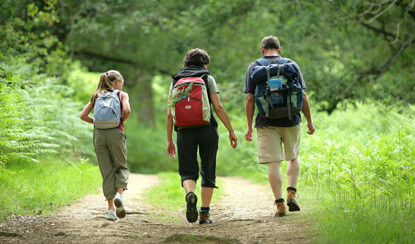 There are innumerable nature walks all around the area for all levels of enthusiasm ! There is a wide variety of restaurants & cafes within a 10 kms radius which are suited for all tastes. The local tourist Information Office is close by and can help you plan a programme of sites of interest. A selection of information leaflets are provided upon arrival to help you find your way around.